ABOUT some synth things but basically an analog preset synth - has a touch sensor - today we call it aftertouch. ABOUT Eine schräge analoge Mischung von einigen Presets und einigen Synthesizerfunktionen und Touch Sensor - also Aftertouch. DETAILS well choose a preset to set a waveform and some settings, the dual mode adds osc sync. there is even a ring modulator withing the preset switches - note the cat sound switch! there is a retrigger for envelope (so to say another LFO) and a random retrigger switch can be set to LFO etc. DETAILS Durch die Presets lassen sich Standardwellenformen und einige Parameter "voreinstellen" - wie der Name schon sagt. Einen Retriggermode für Hüllkurve namens "repeat" gibt es auch. 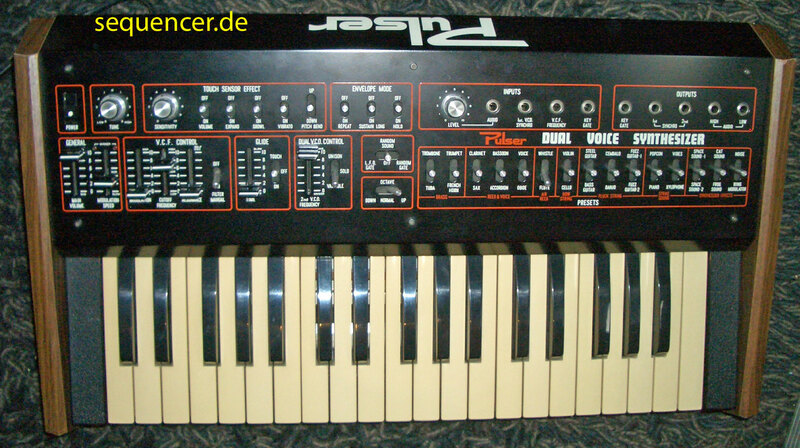 Italian company almost more into organs / keyboards and other instruments but had one real synthesizer. Italienische Firma, früher gab es auch etliche Synthesizer mit dem Namen Pulser, der Hersteller ist aber ebenfalls Solton.